People are becoming increasingly mobile. With the rise of the smartphone and tablets, people perform the majority of their searches while on the go. And when a sink is overflowing or a pipe is leaking, a potential client will likely turn to a mobile device to search for a local plumber. You want to be the plumber who is found. But not only do you want to be found, but you also want people to stick around on your site long enough to find your number and give you a call. A website with responsive web design is easily viewed on any mobile device to ensure that your website’s visitors receive a great user experience that’s custom designed for their device. This translates into more phone calls, leads, and business for you! Ask us about our responsive web design services, part of our SEO package. As more users began using mobile devices to complete their searches and view sites, they began running into problems like long load times and hard to navigate sites. As a result of the mobile search boost, Google released an update known in the digital world as “Mobilegeddon” to circumvent some of these user issues. This update began using mobile compatibility as a ranking factor for SERPs. Companies with mobile-friendly sites were ranked higher than websites that aren’t. Websites that are designed for mobile devices offer condensed content that is often minimized or even foregone in order to present an easily navigable and easy to read site. However, these sites lack important content and optimization details. They are often designed to leave out content and graphics when being viewed from a mobile device in order to improve load speed. However, this eliminates important coding and metadata that Google uses for indexing, leading to lower rankings. Responsive websites respond to the size of the screen they are being viewed on by using specialized coding commands. This allows your website’s information to be fully displayed on any device without the need for component elimination, scrolling, or screen adjustment. Responsive design adjusts components like graphics, images, videos, and even menus and navigation tools to ensure users don’t miss out while offering faster load times. Because responsive web design allows websites to be experienced on any device, your plumbing site can rank higher on local and mobile searches, leading to more leads for your plumbing company. The Tablet View Delivers a More Compact Menu and Smaller Fonts. With Resonsive Web Design, Mobile Views are Automatically Adjusted for the Screen Size. Using responsive design for your website gives you an edge against your competition on SERPs. The goal of search engines is to send their users to a website that is user-friendly, packed full of useful information and easy to navigate. Imagine opening a site on your phone that is tiny, hard to read and impossible to navigate. Google uses user experience and ease of navigation as a top ranking factor for search results. Don’t let your potential clients experience that with your site. 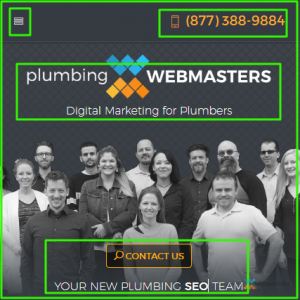 The Plumbing Webmasters team uses responsive design on our website creations to ensure the widest possible viewer reach and the best possible experience. When used in partnership with our other digital services such as content creation and PPC management, your responsive design plumbing website offers unending possibilities for new customer acquisition and lead generation. We work with you to create a website and digital marketing campaign that not only delivers better SERP results but also generates more leads for your business. Call the Plumbing Webmasters team at (877) 388-9884 to learn more about the details of responsive web design and how this innovative structure can boost your website traffic. Updated on April 2, 2019 at 3:36 pm by Plumbing Webmasters.